Welcome to the Wildlife Coexistence Lab at UBC! We are a group of researchers in the Faculty of Forestry at the University of British Columbia in Vancouver, Canada. Our research is focused on human-wildlife coexistence across multiple species and scales, with a particular emphasis on large-bodied terrestrial mammals. 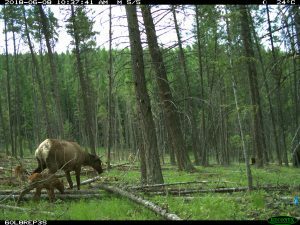 The lab is led by Dr. Cole Burton, Assistant Professor in the Department of Forest Resources Management, and Canada Research Chair in Terrestrial Mammal Conservation. Check out Cole’s Twitter feed and our News and Blog pages for recent updates! 1. The past six months have been an exciting roller coaster of the birth of a new wildlife research project: my master’s thesis. 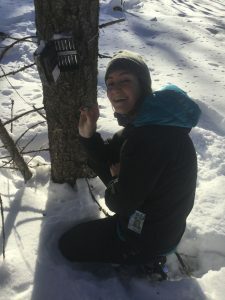 I began my MSc in September of 2018, as a co-supervised student between Cole Burton (Wildlife Coexistence Lab) and Suzanne Simard (Belowground Ecology Group). My work focuses on how forest harvesting methods, particularly partial harvesting treatments, affect terrestrial mammal biodiversity. Forestry is a land-based industry, and much of our province’s biodiversity and social values are intrinsically related to the health of forest ecosystems. One of the first things I learned in grad school is how much I love my project and how lucky I am to be studying wildlife ecology on our forest land base. Figure 1. 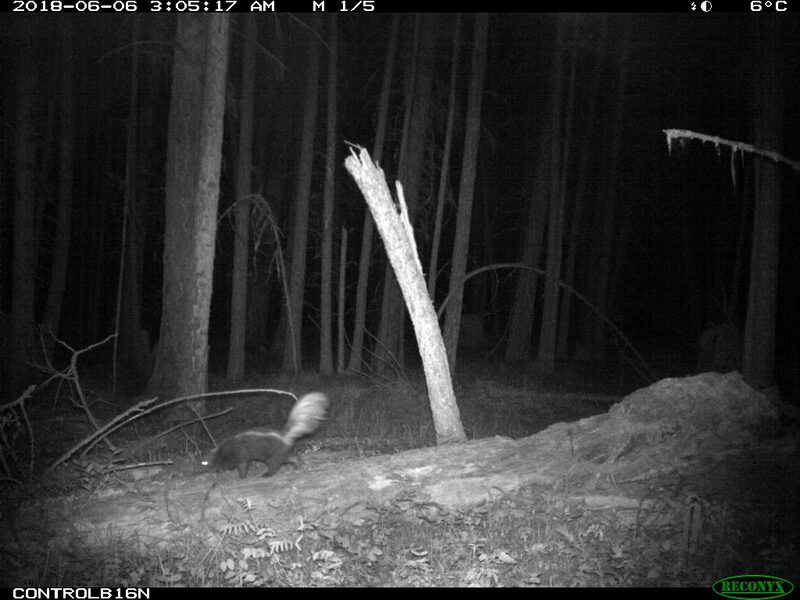 An assortment of the camera trap images of species from my study site in the Kootenays: from left to right and top to bottom, white-tailed deer butting heads, coyotes hunting and observing the camera, a striped skunk (who happened to slip off the log in the next image), and a male elk passing through one of the control forests. 2. Settler-Canadians research, live and work on the ancestral, traditional and unceded territories of 203 First Nations in British Columbia. I grew up in Ontario, near the traditional territory of the Mississaugas of Scugog Island First Nation, who are Anishinaabeg. I feel humbled and grateful to be an uninvited guest on land that has supported over 14,000 years of community and history before my time in BC. I am grateful to be learning about the Indigenous Peoples who live on the territory around me and working towards building trusting, mutually beneficial relationships. 3. 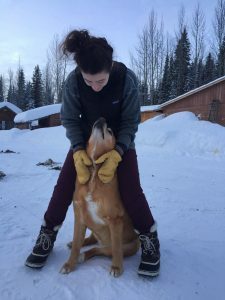 I am continually learning how to work more efficiently, ask for help or guidance when I need it, and lean on wonderful lab mates and friends for exercise breaks during longs days at the computer. In FNIS 533G Indigenous Legal Traditions, we check in each week about how we are striving to live the good life, via Anishinaabe ways of knowing. I am learning and sharing lessons about balancing work and seeking the support, fulfillment and validation we all need. 4. 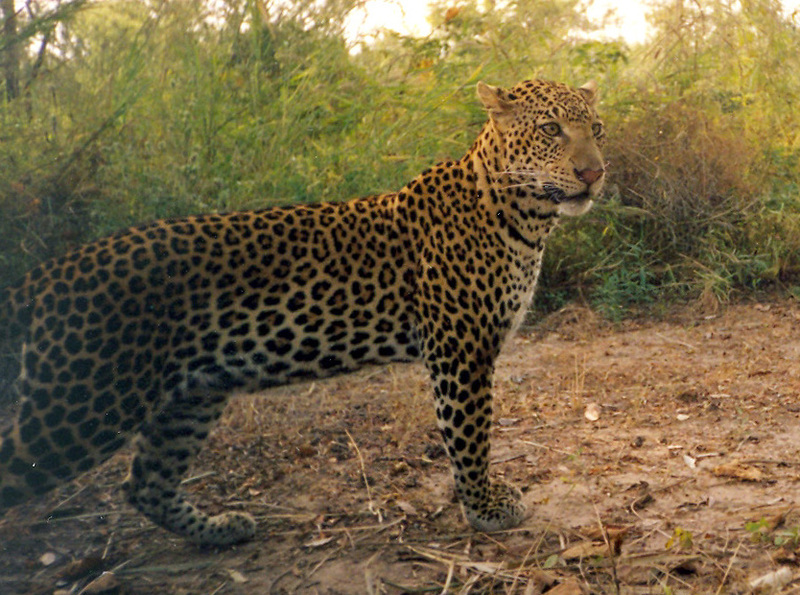 There is a magical and soul-satisfying aspect to looking at camera trap images. For me, this is because, via the lens of the camera, I am able to see how we share the forest landscape with wildlife, if only for a brief moment. 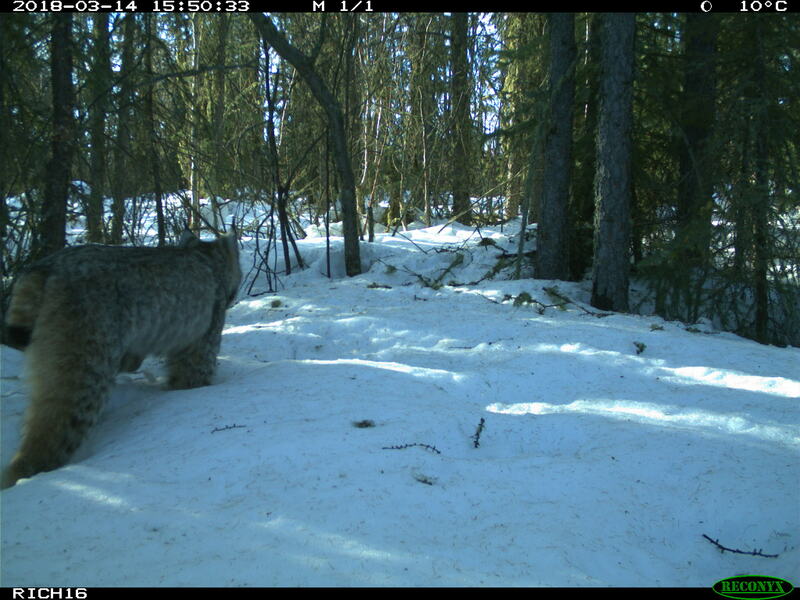 Classifying and going through camera trap images is one of the best parts of this work! I am learning to make the most of that joy. Figure 2. 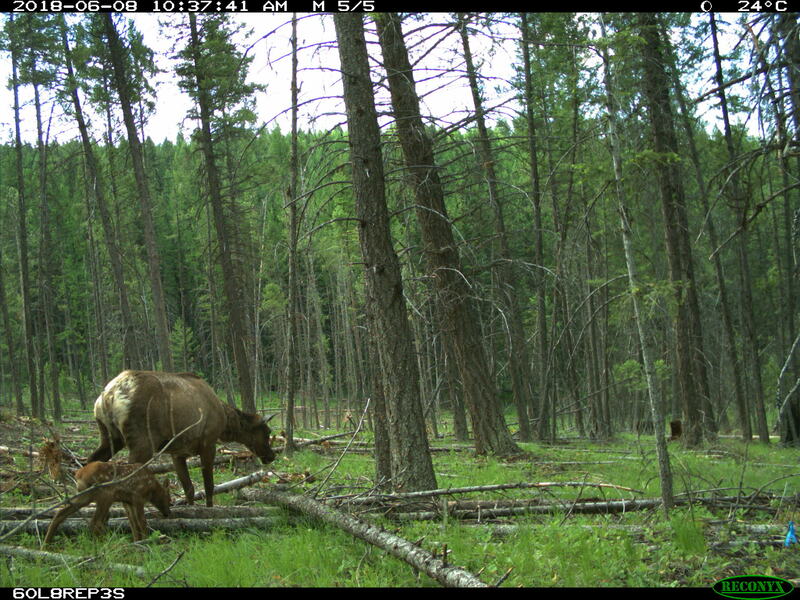 Elk (Cervus canadensis) and white-tailed deer (Odocoileus virginianus) adults with juveniles. A highlight from the first spring with operational cameras at sites in the Kootenays. Figure 3. 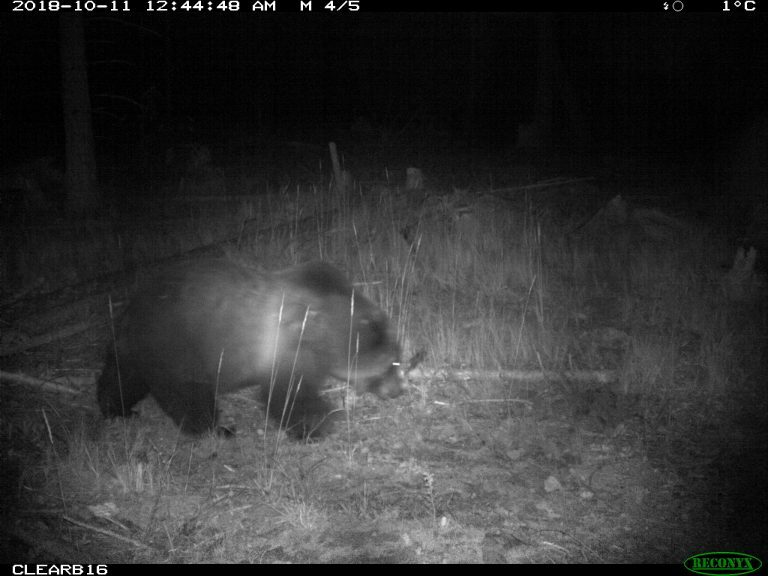 The first bear photos on the cameras (also in the Kootenays)! On the left is a black bear cub (Ursus americanus), and on the right is an adult grizzly bear (Ursus arctos). 5. Winter field work is the best. No bugs, no heat, all blankets of beautiful snow. 10/10 recommend. Figure 4. Enjoying winter field work with one of the dogs at Alex Fraser Research Forest (left), and taking out the first memory card in the Kootenays. 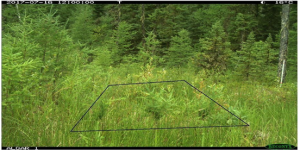 Remote cameras for studying animals or plants: why not both? Figure 1. An example of a user-defined “ROI” or region of interest used in the Phenopix analysis. With one of WildCo’s main study tools being the camera trap, readers of this blog have probably gathered that the use of remote cameras to study the natural world is rapidly increasing in popularity. Remotely-triggered cameras for detecting wildlife have been in use almost as long as the camera has been around: tripwires were paired with cameras in the 1890’s to get animals to “photograph themselves” (O’Connell et al., 2011). And though not quite as storied a practice, remote cameras have been used to capture plants and document landscape change for more than half a century (Alberton et al., 2017). Obviously, these two respective fields have evolved quite a bit since their beginnings. Yet, despite overarching similarities between these zoological and botanical methodologies, and the questions they seek to answer, the twin photographic practices have not often crossed paths. However, the potential to harness camera trap surveys to collect information on both plant and animal communities is enormous. 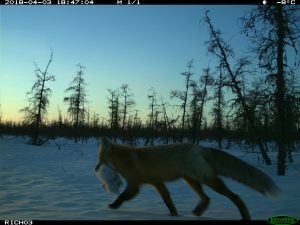 As the saying goes, “a picture is worth a thousand words,” and in camera trapping, a picture can contain a thousand data points. 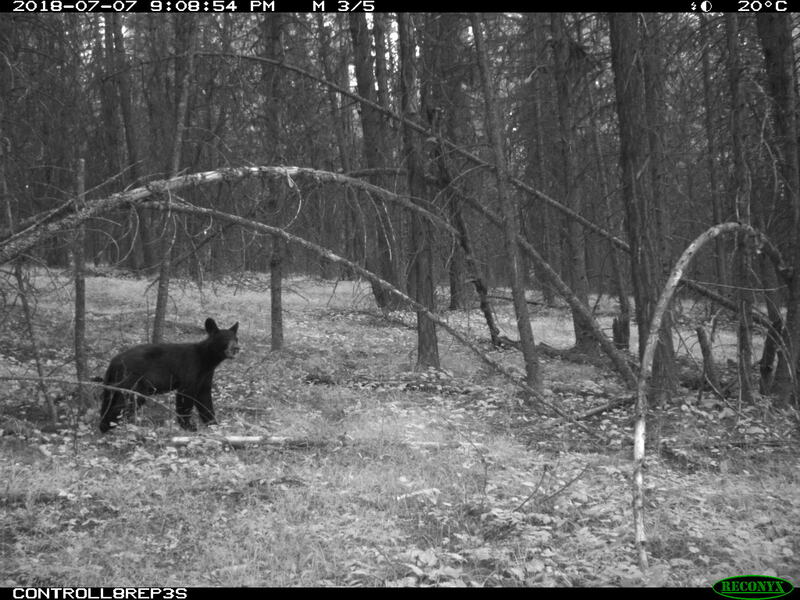 The photographic captures are a treasure trove of information–modern camera traps can record time, temperature, barometric pressure, location, and everything happening in the frame—but usually much of this information goes unused. 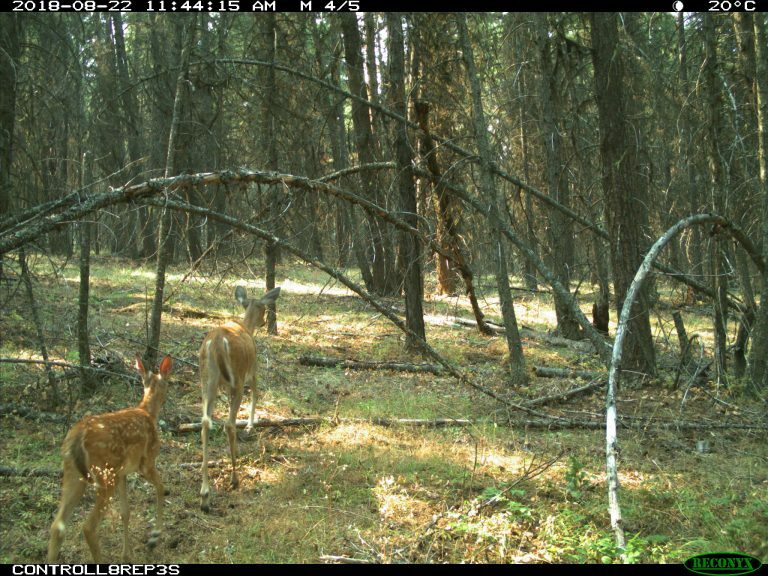 One of the often-overlooked tidbits of information from wildlife cameras is what the plants are doing in the background, rather than what the animals are doing in the foreground. Plants have seasonal life cycles directly linked to climate and weather, and animal life cycles are generally linked to these in turn. Many of the phenomena caused by these cycles within plants are generally quite visible, like germination, budding, flowering, and senescence. However, previously extracting this information from photos was tedious. Now, however, with new automated data extraction tools, this information is much more accessible. Figure 2. 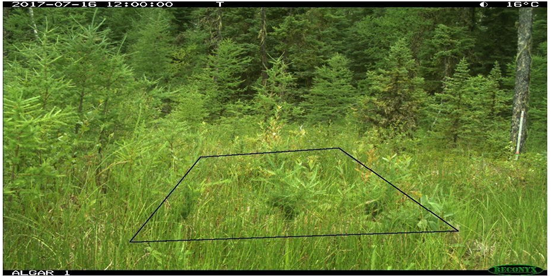 The predicted annual phenological cycle of an example camera trap “region of interest”. Recently in WildCo, our focus has been centred on extracting annual phenological data from images we’ve taken, using an R package called Phenopix (Filippa et al. 2017). 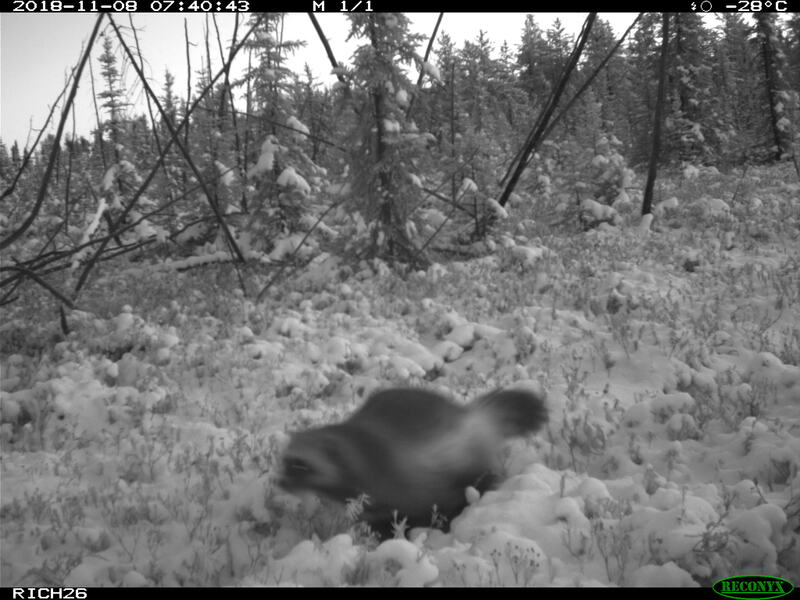 In phenological studies with camera traps, images are taken at least once a day at the same time every day to produce daily time-lapses over time. By then setting a ‘Region of Interest’ (ROI) for our photos within the package, we can look at the growth cycle of a specific type of vegetation, say grass, in the foreground of an image. 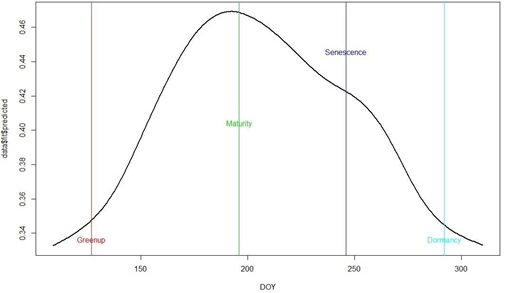 Phenopix can then extract the colours from the ROI and give us a metric of “greenness” for each day. This can be used as a proxy for the plant’s yearly cycle, from budding through green-up to abscission (loss of leaves in the fall). The package will then fit a curve to those values, analyze it, and label those aforementioned events in the cycle, all while computing the uncertainty in the plotted curve and labeling it using built-in functions. And ‘greenness’ is not the only metric that can be produced- information on any of the primary colours can be extracted, and blue can be used as a proxy for snow cover, potentially allowing for quick extraction of snow cover data! Understanding the annual phenology of a collection of sites can have useful implications for wildlife ecology and conservation. For long-term camera-trap studies of animals that already take daily time-lapse images, the captured images could also be providing long-term data on phenological responses to climate change. As the climate changes, timing of budding and other events in the plant life cycles may shift, and these observed shifts might act indicators of climate patterns. These phenological data can also be used as covariates in models to assess patterns and drivers of changes in animal distribution and abundance. It may be that connecting these data on plant phenology to animal detections will offer finer-scaled insights into spatiotemporal patterns of habitat selection for the species that form the backbone of our research at WildCo. 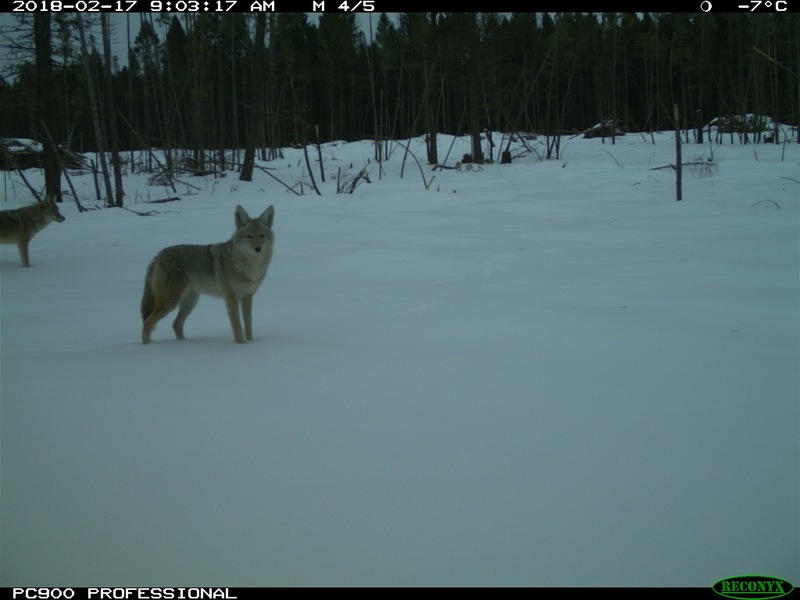 As has been discussed in previous blog posts, careful analysis of these animals’ patterns and tendencies can help inform science-based policies to improve wildlife management. When thinking about camera trap surveys, we often think about dramatic photos of charismatic megafauna, but the environment surrounding the animal should not be ignored. Figure 3. 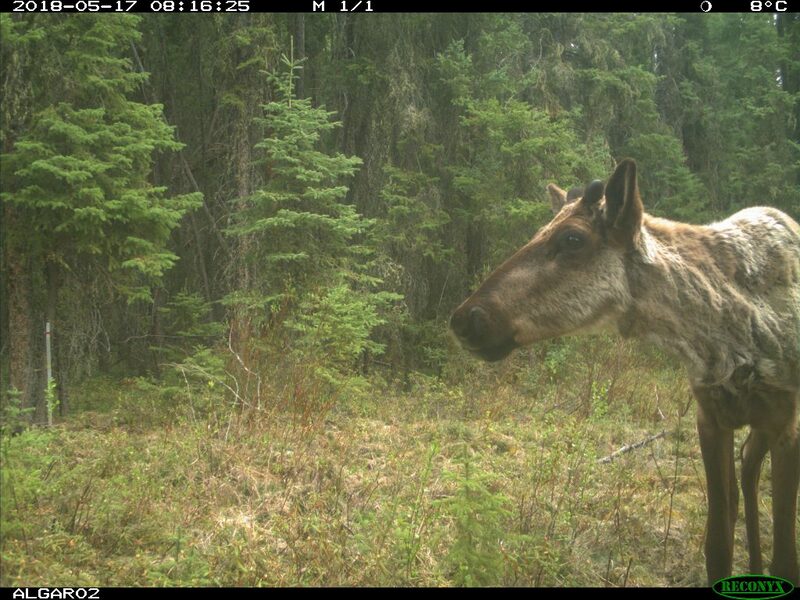 A boreal woodland caribou (Rangifer tarandus caribou) captured on camera. Phenopix may give insights into connections between background phenology/snow cover and species detection rates. O’Connell, A.F., Nichols, J.D., Karanth, K.U. (Eds. ), 2011. 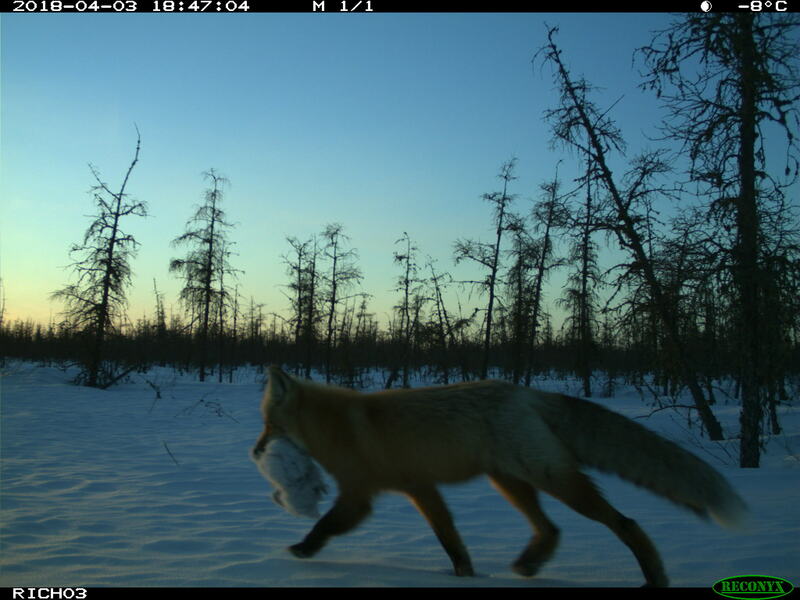 Camera Traps in Animal Ecology: Methods and Analyses. Springer. Descending into our study area in the Richardson backcountry, almost exactly halfway between Fort McMurray and Fort Chipewyan in north-eastern Alberta, stirs up a mix of emotions. 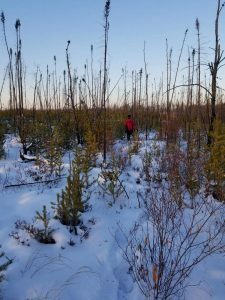 Our study area lies within Canada’s magnificent boreal forest —a fire dominated landscape comprising burned and unburned patches of upland jack pine (Pinus banksiana) and black spruce (Picea mariana) bog. The benefit (or is it challenge?) 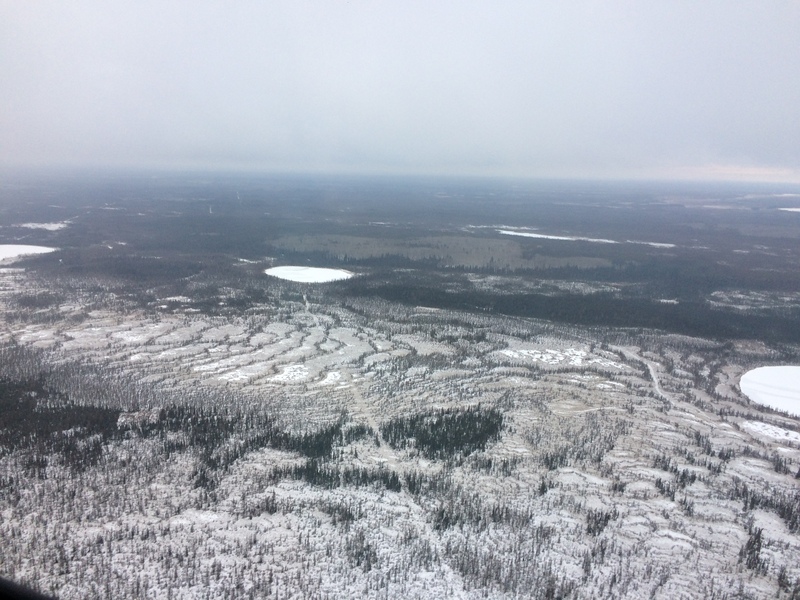 of a remote study location in the boreal forest is that travel is by helicopter and visits are timed to coincide with frozen ground. This also means that we are treated to incredulous, frosty views along the way. Lifting off from a heli pad in Fort McMurray we immediately see the devastation of the 2016 Horse River wildfire (aka ‘the beast) on the city and surrounding forest. 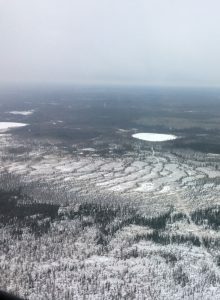 The wildfire scarred landscape is quickly superseded by the seemingly endless, stitched together checkerboards of 3-D seismic lines (linear features created for oil and gas exploration), which changes to the expansive ex-situ mines analogous to “oil sands” in most minds, and finally on to stunning ecological features such as the McClelland Lake fen complex and the Marguerite River, predominantly ensconced within a Wildland Provincial Park bearing its name. It is a stir of emotions because the tendrils of human disturbance are weaving their way into even this remote landscape; outside the park, legacy and newly cut seismic lines criss-cross the forest. And yet, while these linear features transfix your gaze, the omnipresent disturbance is wildfire. In 2011 a massive wildfire swept through the Richardson backcountry —the second largest documented fire in the history of western Canada1. From May to August the Richardson fire burned ~576 000 ha of forest with mixed-severity, leaving some residual unburned patches while other patches burned so severely that all overstory trees died1. To put this into perspective, the entire perimeter of the Richardson wildfire encompassed 658 000 ha, compared to ~590 000 ha for the 2016 Horse River fire. 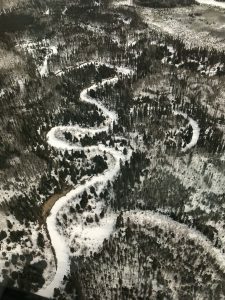 With the changing climate, wildfires in the boreal are expected to occur more frequently and burn larger areas2, making fires like the Richardson and Horse River the norm rather than the exception. Fig 1. 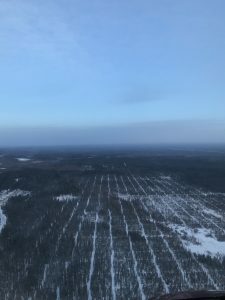 The view travelling north from Fort McMurray to the Richardson; from left to right: 3-D seismic lines, ex-situ oil sand mines, McClelland Lake fen complex, and Marguerite River Wildland Provincial Park. 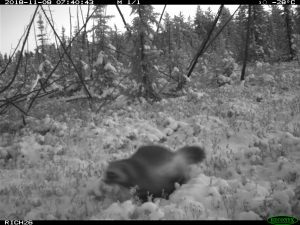 To better equip ourselves with an understanding of how wildlife reacts to wildfires we are conducting a multi-year camera trap study within the Richardson backcountry. 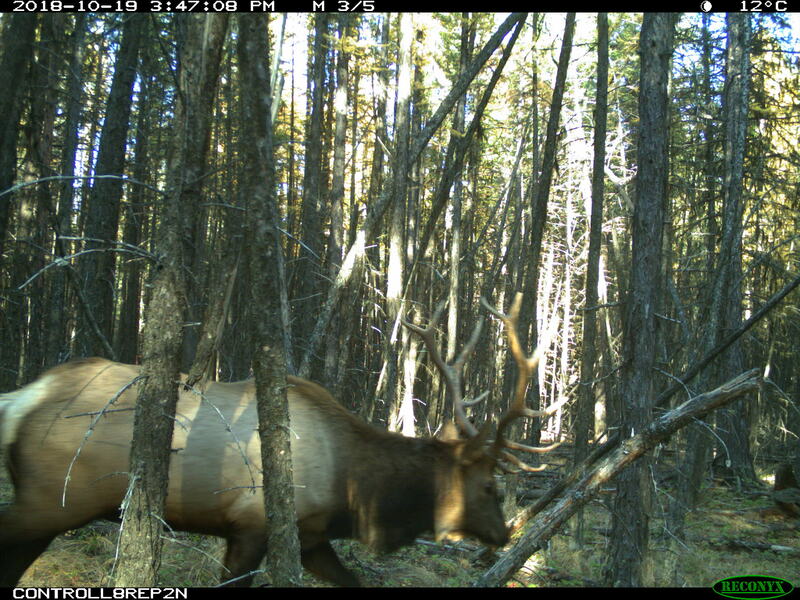 One of the goals of our study is to determine if camera traps can be an effective means of monitoring remote ungulate populations. The other is to study the effects of wildfire and oil sands mining on boreal mammal communities in a system with relatively little human disturbance —the irony of our carbon hungry mode of field travel is not lost on us. In this corner of Alberta ungulate refers to moose (Alces alces) and woodland caribou (Rangifer tarandus caribou). The white-tailed deer (Odocoileus virginianus) invasion has yet to reach this far north. 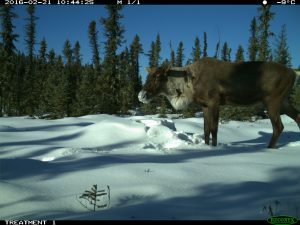 Infrequent government surveys make it difficult to know how populations are tracking over time but it is believed that both moose and caribou populations are stable. A recent government survey estimated 7.0 moose/100 km2, although infrequent surveys make it difficult to know if this is stable3. The draft provincial woodland caribou range plan elevated the status of the Richardson caribou herd to ‘stable’4 from the 2011 federal government distinction of ‘not self-sustaining’5. It is unlikely that the population has improved in the last decade but rather the push for research has provided sufficient data for a more accurate assessment. 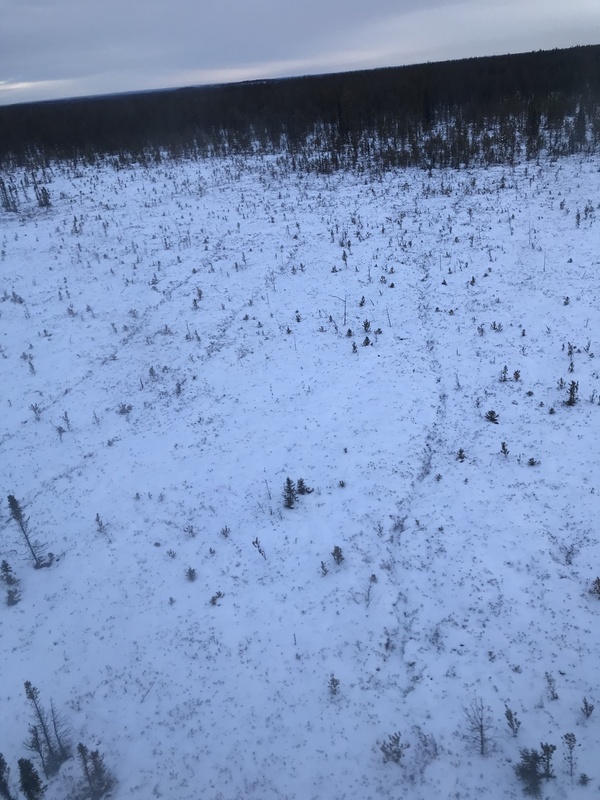 Caribou minimum count surveys equate to a minimum density of 1.8-2.1 caribou/100 km2 across the 707 350 ha of Boreal Shield and Boreal Plains that comprise the Richardson caribou range. Fig 2. The Richardson caribou range comprises 84% disturbed habitat, in the form of seismic lines (left) and wildfire burns (right). So why do Richardson caribou have the fortunate ‘stable’ status, however precarious, when half of the woodland caribou herds in Canada are declining? 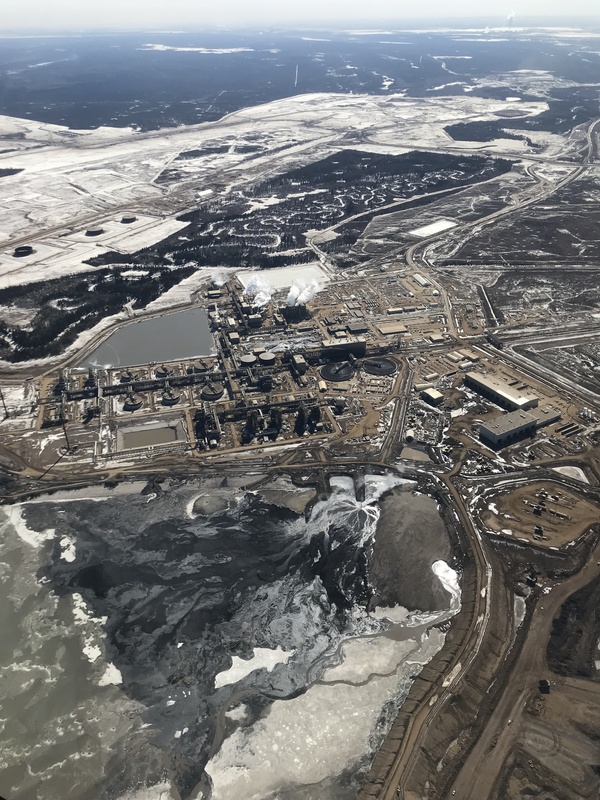 In Alberta, the well-versed answer is human disturbance —predominantly through oil exploration, timber harvesting and road infrastructure— which has cumulatively and rapidly increased disturbance rates in Alberta’s boreal forests6. 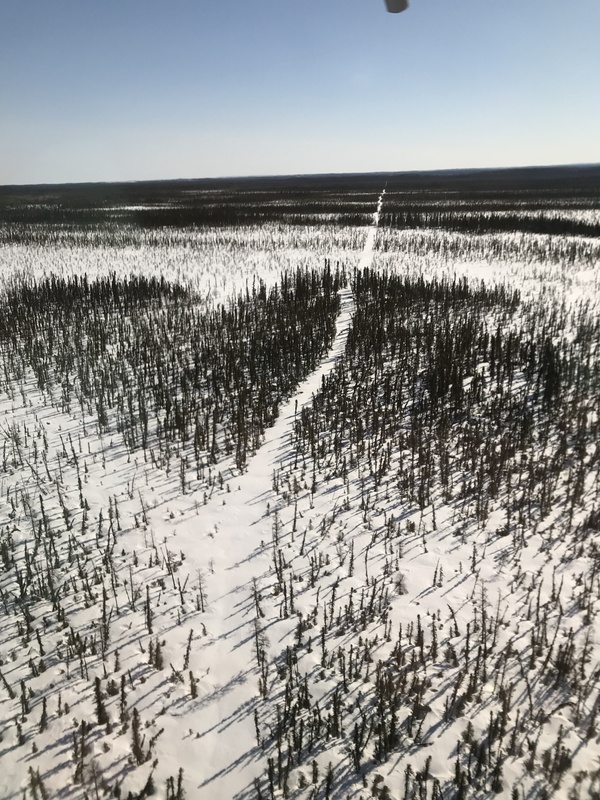 The network of linear features on the landscape allows predators, such as wolves (Canis lupus), better access, as well as the means for faster travel, into the heart of caribou habitat7. 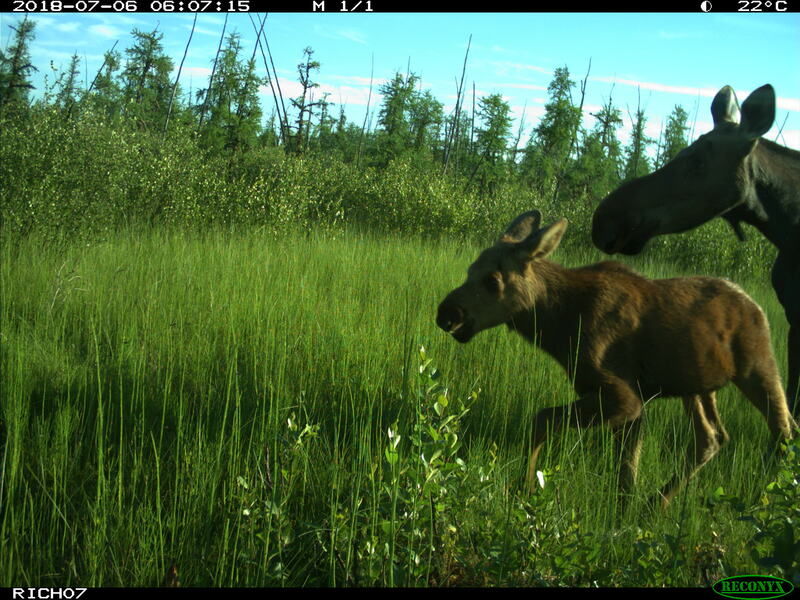 Disturbance also provides foraging opportunity for moose (Alces alces) and white-tailed deer (Odocoileus virginianus), providing abundant sources of alternate prey to caribou predators8. To mitigate against habitat loss, the federal government recovery strategy for woodland caribou requires that critical habitat contain a minimum of 65% undisturbed habitat5. Not one caribou range in Alberta meets this threshold; at best the Caribou Mountain range contains 35% undisturbed habitat , while the Richardson range ties for 3rd with 16% undisturbed habitat4. Disturbance can be either anthropogenic —human disturbance as seen from satellites at a scale of 1:50 000, including habitat within a 500 m buffer— or natural —a wildfire burn less than 40 years old5. It is clear that Richardson wildlife have more natural, than human, disturbance to contend with. 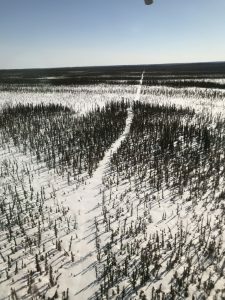 Indeed, 65% of disturbance within the Richardson caribou range comes from wildfire while 36% is attributed to humans, most of which stems from seismic lines4. And so our burning research question asks if a burn erases a seismic line —does wildfire placate the effect of seismic lines on caribou, and the boreal mammal community, or instead might there be an additive or synergistic effect? Fig 3. We have deployed 58 cameras in the Richardson backcountry: 11 outside burn, on seismic; 8 within burn, on seismic; 19 outside burn, off-line; 20 inside burn, off-line. To answer our research questions we have deployed 58 cameras on and off seismic lines, in and out of wildfire burns. 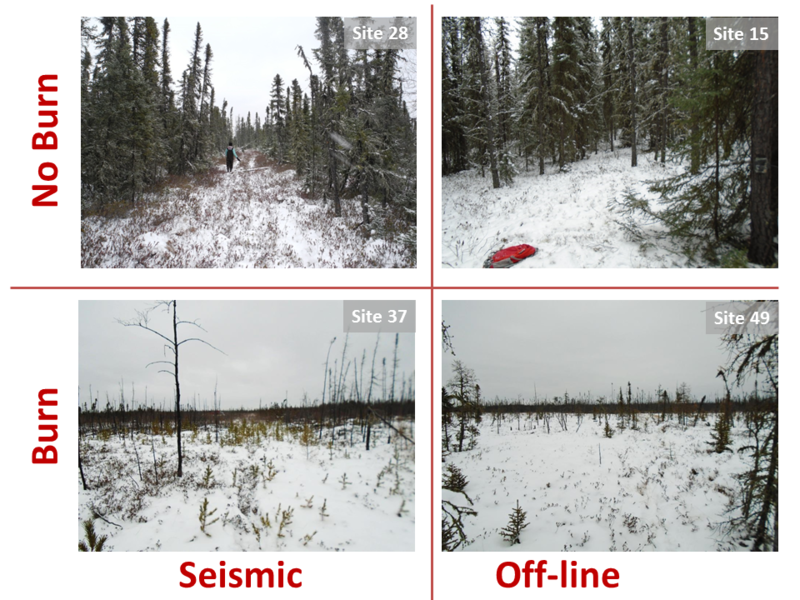 The first 30 cameras were deployed in November 2017, outside wildfire burns but on and off seismic lines. The remaining 28 cameras were deployed in 2018, inside wildfire burns, both on and off seismic lines. We have just retrieved our first year of data and are already learning more about this remote landscape. 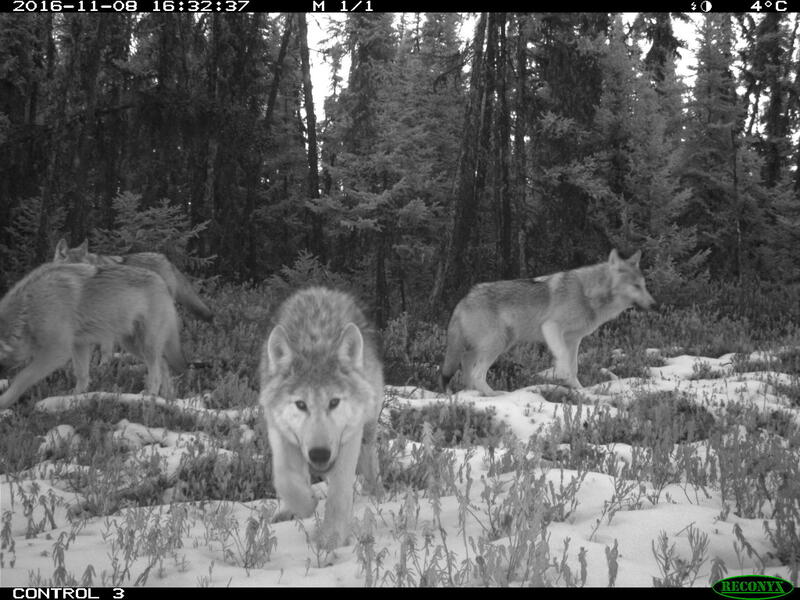 Our cameras have captured elusive species, predatory-prey interactions, recruitment and health of individuals. 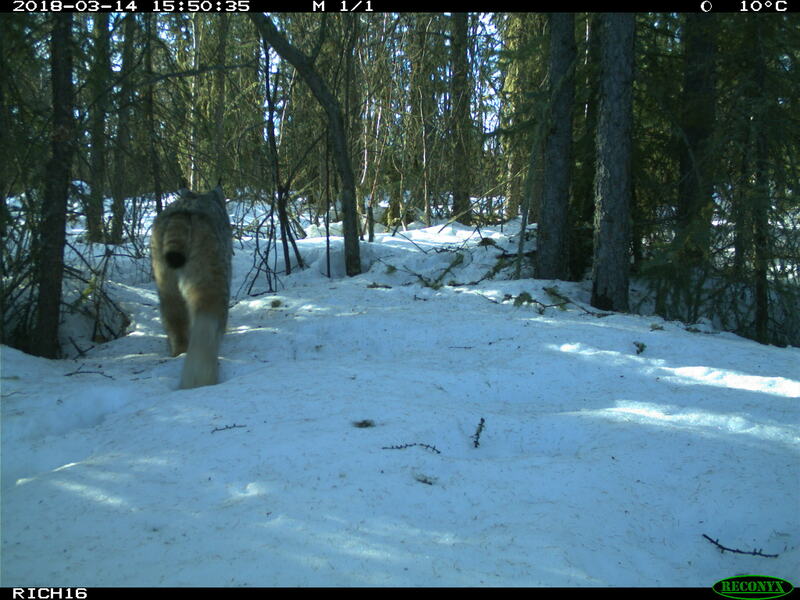 We have detected 14 mammal species, including an abundance of snowshoe hares, one lone detection of a white-tailed deer on the western boundary of our study area and within close proximity to the winter road, and three wolverine detections, spread across the study area. 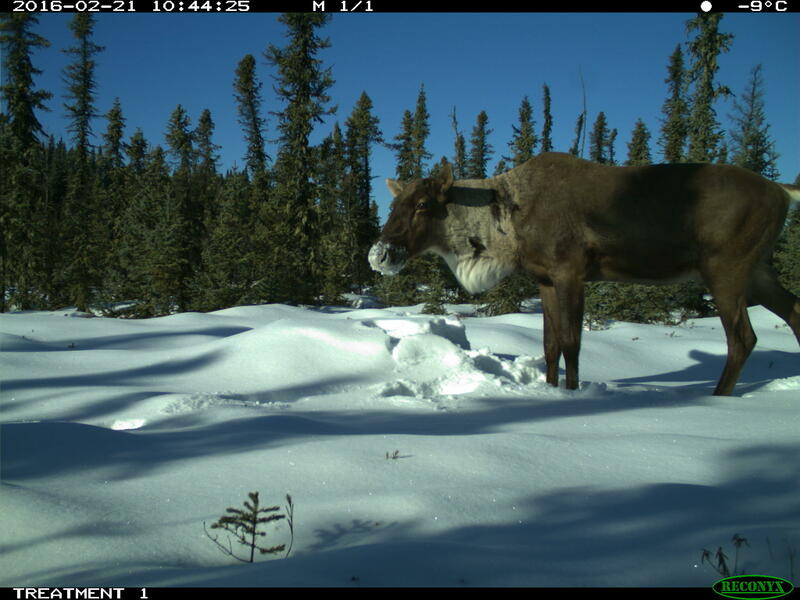 Caribou seem to segregate themselves, hugging the northern end of the study area, while moose and predators tended to congregate in the south-eastern portion of the study area. Preliminary analyses suggest that some species may be avoiding seismic lines, although it’s too early to say for certain. Fig 4. 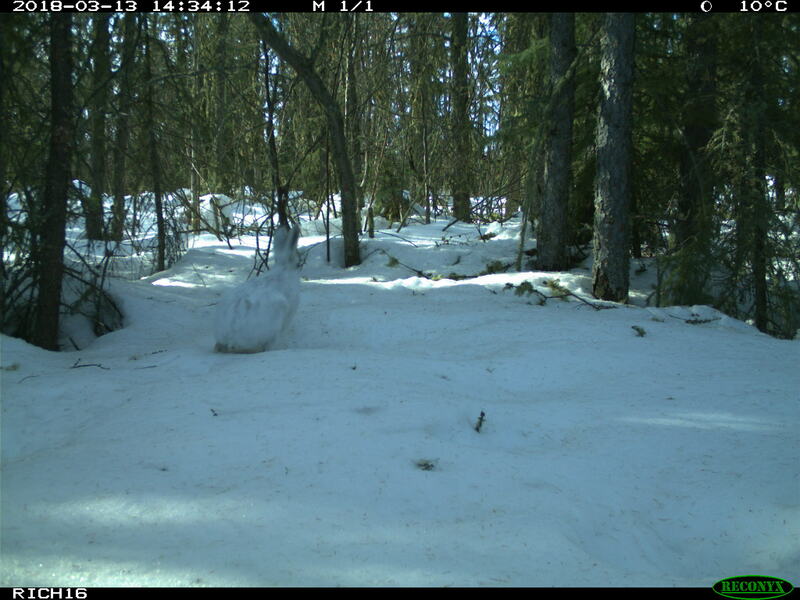 Camera traps capture elusive species (wolverine, top left), predator-prey interactions (fox and snowshoe hare, top center; snowshoe hare and lynx, bottom sequence; and recruitment (moose cow and calf, top right). 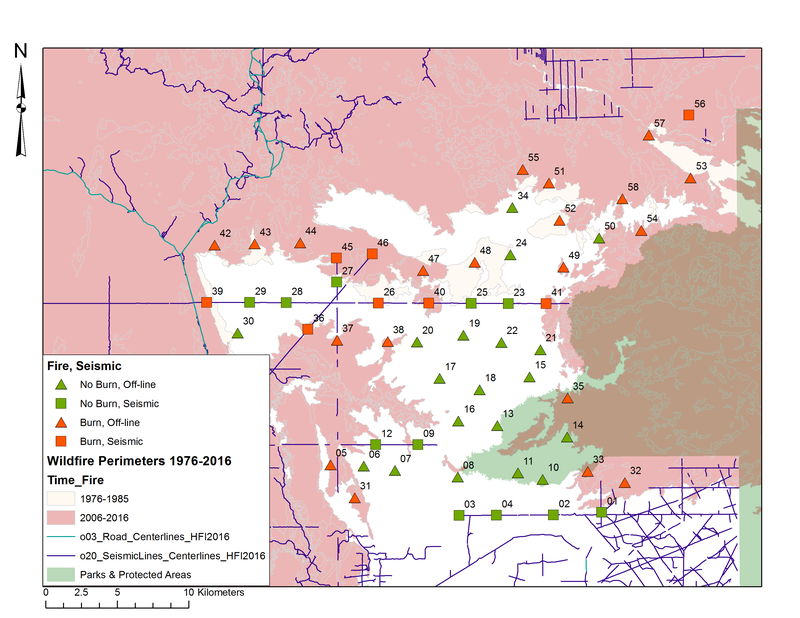 Will these patterns hold true for sites within the wildfire? We hypothesize that in upland areas wildfire may well erase the influence of human disturbance, or at least alter it. 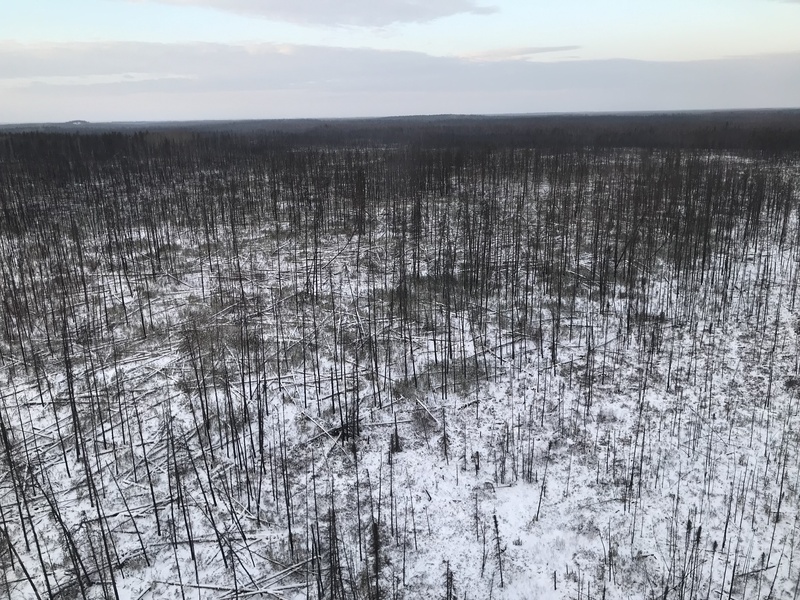 Research shows that within a burn jack pine regeneration on a seismic line is two-fold higher, compared to adjacent off-line areas9. In a fire dominated landscape in Saskatchewan caribou avoidance of human features is inconsistent and scale dependent10. In the Richardson, early findings from a University of Alberta MSc project suggest that female caribou generally avoid burns: avoiding burned landscapes entirely at the home range scale and burned patches at the local scale (Sean Konkolics, pers comm). 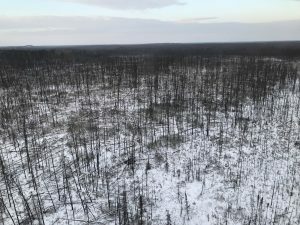 How will the rest of the boreal mammal community react to burns? We eagerly wait for next November when frozen ground conditions permit us to once again visit our study area and review which species have made an appearance on our cameras. In the Richardson backcountry, wildlife live in a world of ice and fire, although in this Westeros the long night is unlikely to be coming anytime soon. Fig 5. 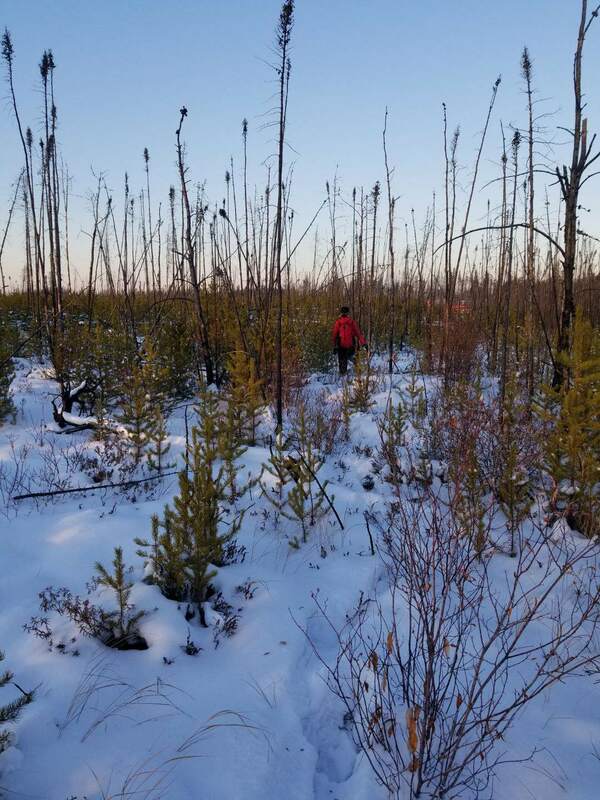 Caribou tracks crossing a black spruce bog, a collared caribou cow and calf, and me traversing a wildfire burn en route to a camera trap (photo credit, Erin Tattersall). Pinno BD, Errington RC, Thompson DK. Young jack pine and high severity fire combine to create potentially expansive areas of understocked forest. For Ecol Manage. 2013 Dec;310:517–22. Wang X, Parisien M-A, Taylor SW, Candau J-N, Stralberg D, Marshall GA, et al. Projected changes in daily fire spread across Canada over the next century. Environ Res Lett. 2017 Feb 1;12(2):025005. Alberta Environment & Parks. 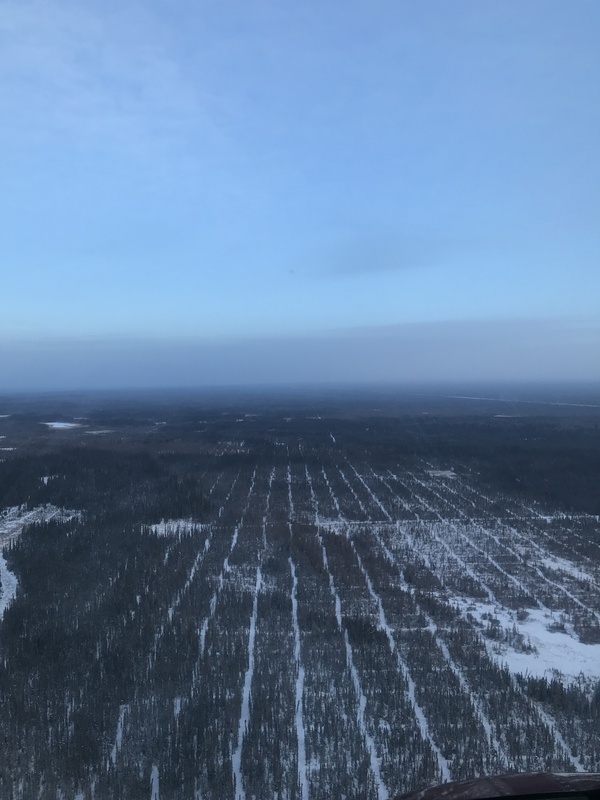 Wildlife Management Unit 530 moose aerial survey (2018). Edmonton, Alberta, Canada; 2018. Alberta Government. DRAFT Provincial Woodland Caribou Range Plan. Edmonton, Alberta, Canada; 2017. Environment Canada. 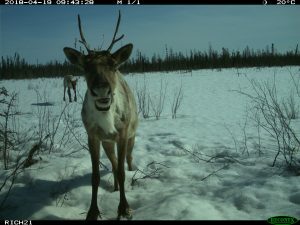 Recovery Strategy for the Woodland Caribou (Rangifer tarandus caribou), Boreal population, in Canada. Species at Risk Act Recovery Strategy Series. Ottawa, Canada; 2012. Hansen MCC, Potapov P V, Moore R, Hancher M, Turubanova SA a, Tyukavina A, et al. High-Resolution Global Maps of 21st-Century Forest Cover Change. Science (80). 2013 Nov 15;342(6160):850–3. 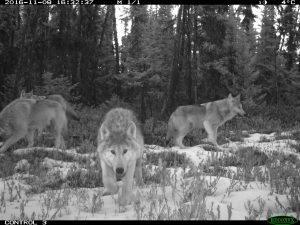 Dickie M, Serrouya R, McNay RS, Boutin S. Faster and farther: wolf movement on linear features and implications for hunting behaviour. du Toit J, editor. J Appl Ecol. 2017 Feb;54(1):253–63. 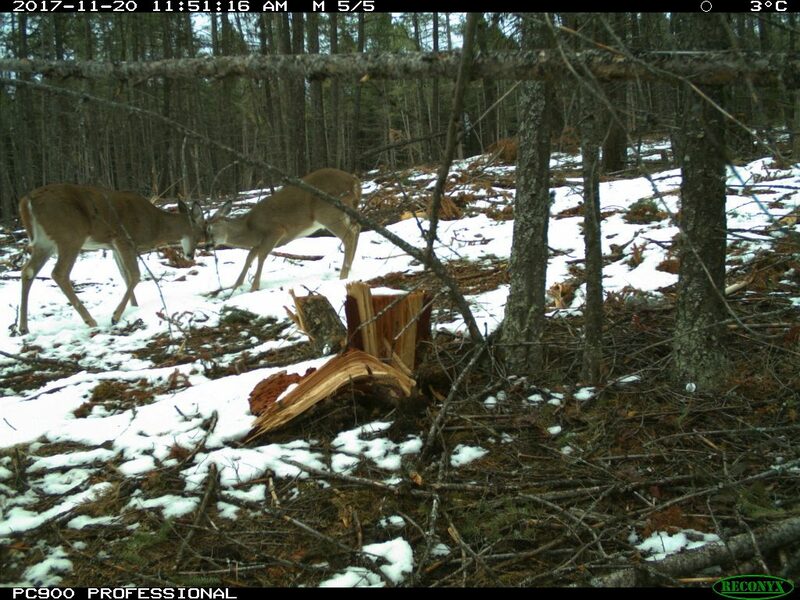 Latham ADM, Latham MC, Knopff KH, Hebblewhite M, Boutin S. Wolves, white-tailed deer, and beaver: implications of seasonal prey switching for woodland caribou declines. Ecography. 2013;36(12):1276–90. Filicetti AT, Nielsen SE. 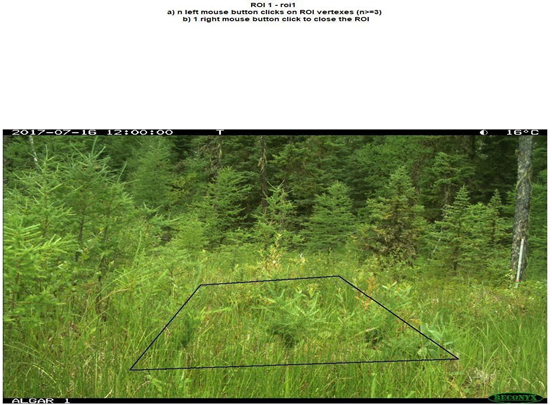 Fire and forest recovery on seismic lines in sandy upland jack pine (Pinus banksiana) forests. For Ecol Manage. 2018 Aug;421(December 2017):32–9. Mcloughlin PD, Stewart K, Superbie C, Perry T, Tomchuk P, Greuel R, et al. Population dynamics and critical habitat of woodland caribou in the Saskatchewan Boreal Shield Status of Woodland Caribou in the Saskatchewan Boreal Shield. Interim Proj Rep. 2016;162.